It's spring! At least the last few days have been, I doubt it'll stick. Last year we couldn't turn the heat off for good until may. Which doesn't make sense, because it's not like it snows or anything here. It's just really, really windy. I've been really into plants lately, since I've discovered I CAN keep them alive. I have a lot of seeds, left from last year as well as ones I got from work (they throw out all the old seeds from the year before, so I snagged a bunch) and ones I bought this year. I've been planting, so when we move into our new house (in three weeks! I'm excited!) I can fill our little tiny patio with plants. 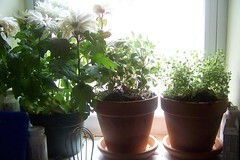 Herbs are on sale at Wholefoods, two plants for $5, which with my discount, is pretty sweet. 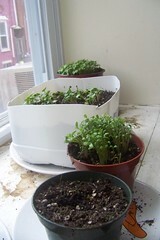 I've got a windowsill full or little sprouts, and today I'm planting more for the other south-facing window. When I was home for Christmas, I got a recipe for a lemon bread my mom used to make when we were kids. It's been sitting in my recipe box since then, and yesterday I was looking for something to make for dessert that would be quick and easy, and I had bought a bunch of lemons at the Asian grocery store. I whipped it together, and it tastes just like I remember. It's a basic loaf cake, which get a syrup of lemon juice and sugar poured over it after it's cooled. This gets absorbed around the edges and on the top, giving it a sweet/sour kick. It was just as good the next day, with coffee (or, even better, tea) for breakfast. Original recipe from the Williamsville Inn at Stockbridge, MA. Combine the first four ingredients in the bowl of an electric mixer and mix well. Add the rest of the ingredients and mix just until combined. 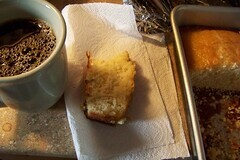 Pour into a greased loaf pan, and bake 35-45 minutes at 350, until a toothpick inserted in the middle comes out clean. Cool. Pour glaze over cake. Combine in a saucepan, and cook over medium heat until sugar is dissolved. Can be made in advance and reheated. ohhh maaaannnn I love this cake! this was one of my favorite things mom made, and one of the first things I ever baked. the lemon glaze is AWESOME. I know! I thought about you while I was making it. Now you can make it GF! It's just as delish!! can this be made into mni cakes, and at what degree and how long to bake it.